By Admin on Saturday, March 3rd, 2012 | Comments Off on Welcome! Posted in Tax Preparation Services	| Tags John Geraci tax service, Tax Preparation, Tax pro	| Comments Off on Welcome! 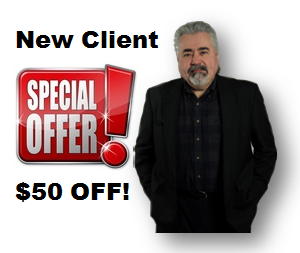 For any new clients this year in 2014 and going forward I would like to extend to you my $ 50 off prior year tax preparation fees offer from any "Big Block" tax preparation chain. Just bring in your last year's return with proof of your fees paid and I will guarantee you at least $ 50 off preparation fees for a similar tax return. A minimum charge of $ 75 applies to all returns (Federal and one state). I also offer a free review of your prior three years' returns prepared by your former preparer. If I find errors that would require an amended return I will discuss your options and only charge for the amended return preparation. Refund options include Direct Deposit and a prepaid Debit Card (given to you at the time of final processing). This debit card will load once your refunds have been processed by the IRS and the state. Call me or contact me thru this website for a no obligation consultation to discuss any concerns you may have. Thank you for taking time to visit my website. The new tax law of January 2, 2013 to avoid the "fiscal cliff" had a few Key Business Issues to deal with, extending some expiring provisions retroactive to the beginning of 2012 and extending them thru 2013. Does the New Tax Law of January 2, 2013 Affect You? The new tax law of January 2, 2013 to avoid the "fiscal cliff" probably doesn't have much effect on most middle-class Americans. The law, dubbed "The American Taxpayer Relief Act of 2012," really has no exciting provisions for most of us hard working Americans who make under $ 400,000 per year. The IRS was preparing for falling "off the fiscal cliff" until the turn of the year, when at the last minute Congress decided to pass the "American Taxpayer Relief Act of 2012" at midnight December 31st and the President signed it into law on January 2nd. The IRS computer programmers were hard at work to revise their software to redo all tax forms which has put tax filing and processing on hold until January 30th. New York State has also gone along with this date. Updated: The IRS just released more delays in processing any returns with Depreciation Form 4562 or Education Credits on Form 8863 until mid to late February. What does this delay in tax processing mean to you? Honest opinion? I think it's good for most of my clients because it gives everyone time to compile all of their data and forms that may come in the mail in late January and early February, such as W2s and 1099s. Many times a tax return will get completed without a form or two that a client forgot they had coming. So be patient. I know most of the common folk who expect a good sized refund like to file as early as possible but you have no option this year but to wait. Hey everyone just want to welcome you to my new website. Please check back regularly because I will be blogging about topics that may interest you. For those that are new, I have been serving the greater part of Chautauqua county since 1980 with all of their tax preparation needs. 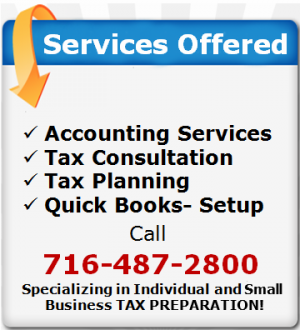 I specialize in helping individuals and small businesses with their tax and accounting needs. I promise PROMPT and personal hometown service.